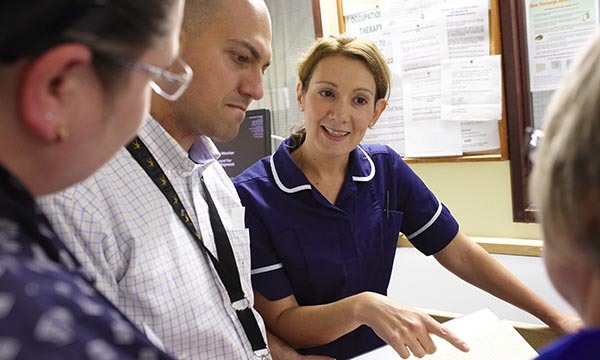 I’ve just spent a couple of days sifting through the amazing entries for Team of the Year – one of the award categories for this year’s RCNi Nurse Awards. It wasn’t an easy job, with so many wonderful examples of nurses and their colleagues working in multidisciplinary teams to reduce hospital stays, improve patient experience, stem the number of nurses leaving the profession and develop infection control measures. You’ve no doubt heard the mantra ‘there’s no ‘I’ in ‘team’. Team working is essential, and great when it goes well: when you see healthcare professionals working together and pushing (or bending) professional boundaries in order to improve patient care. But there is always a need for leaders – and that’s where the ‘I’ is essential. You may not be leading the team as a whole. Your role could be to lead on a specific part of the team’s programme, such as collating the results, or keeping to the planned timescale. The stand-out entries for me were those that defined their goals at the outset, decided how they would measure them, set themselves a target date for achieving that goal, and then made sure they collected the data to prove the benefit (or otherwise) of their intervention. Without the evidence, how can funders ever know whether or not a clinical procedure, nurse intervention, or new staffing approach to care makes a difference? Think about it: what does your personal success look like? And how is your manager measuring the success of your team? In today’s difficult financial climate, it takes more than anecdotes like ‘oh Mrs Blogg said we treated her husband really well’ or ‘Patient X gave us a smile today’. While comments like these matter and – if collated properly – can make a difference to the perceived success of a project, mere anecdotes are unlikely to swing a funding decision. You’ll need to be more rigorous than that. If you personally or your team as a whole, aren’t sure what success looks like for you, then it’s time to do your homework. You can start by watching out for the list of category finalists, which are due to be announced on 9 April. Or take a look at our article about combining clinical and research careers.